The album Trash is playing a part in focusing on a new path in new Danish composition music. Traditional boundaries are being erased while the evident distinction between composer and musician is dissolved. As soloist accordionist Frode Andersen has actively worked with the five composers in the making of the works on this CD. Sketches, improvisations and skew ideas from musician and composer have been recorded. And all this 'trash' has subsequently been edited on the computer into a compositionally complete expression. "The music that succeeds in making an impression on me is in some way thoroughly conceived in the medium in which the listener encounters it. Whether it's a particular concert form, a CD, a theatrical production or something else. For then the music is one with the situation, and it may be pathetic or fantastic, pretty or ugly, beautiful or nasty, or all of these at once or something else altogether; it will have a decent chance to exercise its power." The above quote is from the 34-year-old Danish composer with the pen-name Jexper Holmen. It pinpoints a tendency of the age that has become more and more marked over the past few years in the international as well as the Danish contemporary music milieu. The tendency is all about the dissolution of the traditional musical boundaries - and the breakdown of the distinction between composer and performer. It's about making the music more relevant, since the musician gives up his or her humble decentralized role while at the same time the composer is deprived of his elevated position in an ivory tower. Contemporary music, in the sense of avant-garde composition carefully notated by a composer in a detailed score, which is then inter-preted as faithfully as possible by a number of musicians in a concert - this modernist type of contemporary music is at present increasingly being replaced by music created with working methods more like those traditionally asso-ciated with the rock and jazz genres: improvisation and the collaboration of equals - methods, one might add, that were also the norm in western European composition music at least well into the Classical period, and which were only really abolished by the notation-fixated modernism of the twentieth century. Today more and more performers and composers are moving away from the aesthetic of modernism and its rigid distinction between composer and performer. The two parties want to merge together again, either in one and the same person or by working closely together as two people, so that the music is created jointly - and then no longer takes on the character of a sacrosanct object, a so-called ‘work' offered by the composer to the performer for interpretation, but instead becomes a musical experience that finds its form in a ‘now', in an encounter of composer, performer and audience, with the degree of improvisation and spontaneity this entails. If the music is then captured for posterity on CD, it is the form of the music in the captured moment that is preserved, not the music as a definitive work. The tendency is noticeable in a string of Danish composers, musicians and electronica artists who make electronic or electroacoustic music on the borderline between work and improvisation; and on the borderline between what we have traditionally called classical music and rock/jazz. From the electronica works one can name at random musicians with performing names like Bjørn Svin, Opiate and Txture. From the so-called classical world come a number of younger names like the composer and guitarist Morten S. Danielsen and the composers and sound producers Ejnar Kanding and Jens Hørsving, all three of whom, in different roles, have contributed to this CD. In the text from which the epigraph to the article comes, Jexper Holmen talks about the ongoing paradigm shift. With the artists mentioned in mind - and a good many others - he imagines himself into the future, far from classics like Bach, Beethoven and Brahms - or for that matter classic modernists like Boulez, Ligeti and Nørgård. "Perhaps", writes Jexper Holmen, "one will - no longer? - see the image of the composer working in isolation in his garret thinking up eternal masterpieces and elaborating them in formally perfect scores, as the epitome of musical creativity." No, perhaps the future of these composers really isn't a foregone conclusion. One could also choose to follow Frode Andersen in this even more rabid formulation: "All that stuff with the composer who creates lofty inviolable art in his lonely room - that's a new idea, and perhaps that kind of composer has never existed. Bach didn't see himself a an artist. Haydn papered his walls with his old music. The artist, as the Romantic ideal portrays him, has maybe never existed. Maybe he only exists in our vision of him." The truth presumably lies somewhere midway between. On the one hand it is well known that Beethoven refused to take a violinist seriously when he complained over something difficult that Beethoven had composed. On the other hand Mozart never wrote arias for his operas until he knew exactly which soloists he was writing them for, so he could use their personal strengths. At all events the project trash is an example of how, in our own day, it may once more just as easily be a musician as a composer who takes the artistic initiative. Even if the scene is not the traditionally ‘rhythmic' one and the idiom of the music is more complex than that. With the musician - in this case the accordionist Frode Andersen - as the person gathering up the strands, trash has succeeded in creating art that lives, with a vibrant presence; perhaps also a presence that is different from the result we would have if the performer had stood on the sidelines and faithfully/dutifully interpreted someone else's written music. The showdown with scored music is on. trash has as its declared aim to place the musician at the centre of the creative process. Alongside this re-placing of the performer, who deliberately moves from the role as servile interpreter far into the domain of the composer, the intention has been to drag the composers out of their ivory towers, explains Frode Andersen. 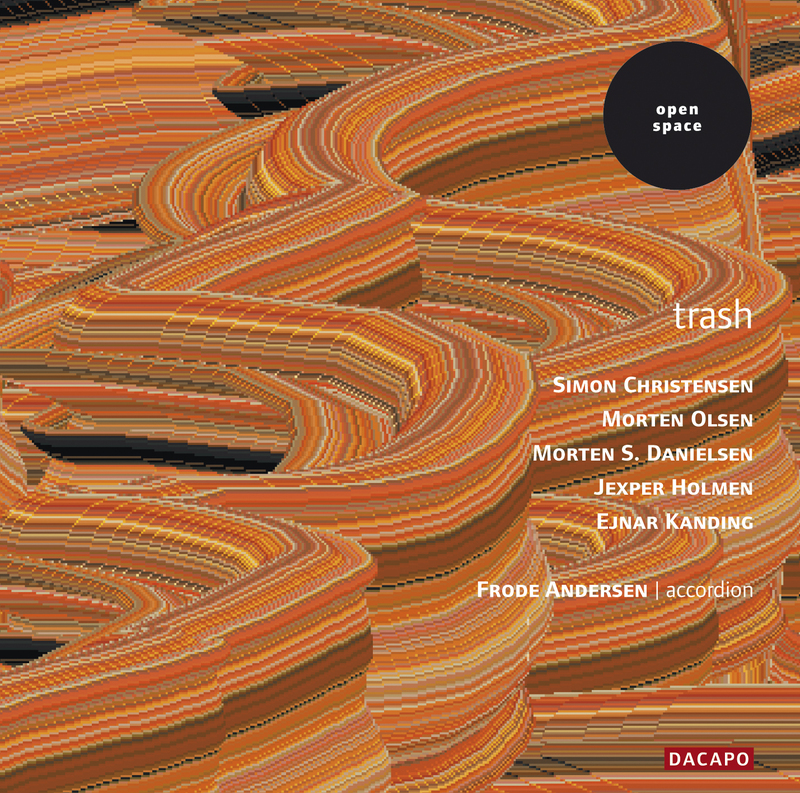 trash has thus been created with the involvement of a total of five composers, all of whom have worked to Frode Andersen's instructions. These instructions have addressed both the composition process and the character of the music. Two of the works, Frode Andersen decided in advance, were to be composed very quickly and were to be similarly quick to rehearse. One of them was to be a monophonic melody. Finally, three of the works were to be remixes of an improvisation that Frode Andersen recorded in a single 18-minute unedited take and then presented to the composers. Frode Andersen, who himself loves electronica, is enthusiastic about the idea of the remix, because, as he says "a remix can be remixed!" The first and the last of the three remixes - respectively by Simon Christensen and Ejnar Kanding - use fragments from Frode Andersen's improvisation. Simon Christensen is a composer and drummer with a rock background. His music tumbles to the ground in low, slow pulsation. The sounding result explains the title, The Acc's Low Track, where ‘acc' is an abbreviation of accordion. The music crashes. It belly-flops. And then we move into a surreal labyrinth. The grasshopper sounds are still there, but we approach what has perhaps become a heart, pulsating in slow motion, until metallic sounds in this surreal trip make the world cold and empty. The second remix, made by the Morten Olsen, who trained as a bassist, is very different. It doesn't take any great powers of association to link the regular electronic beeping sound at the beginning with the fact that the title ranos spelled backwards gives you the word sonar. We are beneath the surface of the sea in this, the longest of the CD's three remixes, where the accordion meets the faint glow of angler-fish, the phosphorescence of seaweed and ... well, continue at will with the underwater associations set in motion by the title in combination with the melancholic-phantastical sonic universe of the piece. Morten Olsen is the only remixer on the CD who has been allowed to add sound elements that do not come from Frode Andersen's improvisation. For example, we hear an electric bass several times in the course of the music. The sound of something resembling gay dance music from a worn LP played on the radio is in fact from the accordion improvisation. And there is some indication that a critical situation arises before the sonar - now alone? - emits its scanning, blinking sounds for the last time. The other three pieces on the CD were written down as sheet music. In other words they are in that sense traditional works, although the performer to some extent has electronic processing, including delay, at his disposal to expand his interpretative freedom. Morten S. Danielsen has approached the task by writing quickly and producing music that can be rehearsed correspondingly quickly, composing a suite of nine movements called 9 ways to wake up. The associations tend towards the self-destructive, and to begin with everything is white. Perhaps the waking up takes place in a hospital? Maybe after an overdose? But soon there is a shift to the ‘dirtier' rock-inspired idiom for which the self-declared anti-composer is well known, and which with its solid rhythmic and repetitive effects has supplied the title of the CD as well as the title of Morten S. Danielsen's movement, Trash. It can also be noted of the movement titles that Andy Kaufman was an American comedian and writer who, like Morten S. Danielsen's other declared idol, the Nirvana singer Kurt Cobain, died young. Originally the idea was that the impression of a ‘dirty' sound was to be a dominant factor in 9 ways to wake up, brought out by the use of effects and overdubbing. Along the way this version was rejected in favour of the gentler acoustic version recorded here, which - with the use of an amplified metronome in the third-last movement - nevertheless to a certain degree retains the raw, trashy expression. In a third version the suite has been rearranged for ensemble and in that form has been recorded by the Danish ensemble Contemporánea on the CD Roadmovie accessories, which exclusively features works by Morten S. Danielsen (MSDTC1). Jexper Holmen's prefer takes the form of a series of even dirtier musical brushstrokes. Here we have what could almost be called washes or flushes of sound. On the one hand aggressive dabs formed conforming to the prescription "it has to be written quickly and be easy to rehearse" as five series of chords with accompanying playing instructions. This piece uses delay as well as ring modulation, and the music is overdubbed. The piece consists (cf. the number of chord series) of a total of five sections. Each chord in each section can be repeated endlessly. The same goes for groups of successive chords, say the playing instructions, which for the first section prescribe a general pulseless character "without sharp edges", inasmuch as the section is to be formed as one long crescendo towards the concluding fermata. The second section should be formed as a regular pulse of crescendi and diminuendi, with an alternation between two prescribed rhythmic treatments of the chords, and with deliberately irregular pulses in some places, as the ‘regulations' dictate. The third section is to be formed like the first, but "with a little more edge". The fourth section is to be formed like section two, but "less irregularly". Finally, in the fifth and last section the series of chords is to be treated so that it creates a texture of beats and afterbeats that become ever more varied and free. At the same time, the composer demands, figurations are to be quoted from the preceding sections. If Frode Andersen has chosen to elevate the movement title Trash from Morten S. Daniel-sen's suite to the status of the title of the whole CD, it is because, as he puts it, it is "fun picking something up that really isn't anything and then processing it so that it becomes something. We should jam more - as we learn from the Baroque period - and allow it to sound ugly too. The interpreter should have his freedom." That is the idea of the remix. It's the idea behind the interpretation of Jexper Holmen's chord series in prefer, and deepest down it's also the idea of the last piece on the CD, laughing out loud inhaling the SCARLET SPLEEN (... fade to black). This piece is the CD's monophonic composition. It is so folksily simple and touchingly tonal in its acoustic shuttling between B flat major and G minor that even the smallest of the rhythmic and tonal twists to which the melodic material is subjected along the way seem like worlds collapsing. Here we have what is at once the CD's most traditional piece and a core example of the Dogma-like limitations that have generated it, explains Jexper Holmen, while conceding that "as the composer involved I have to admit that my little melody would hardly have seen the light of day if it hadn't been tricked in from the outside." And that brings us to the place Frode Andersen wanted to go with the music - the place where it is not created and written down in a more or less brilliant composer's secluded, elevated ivory tower but arises in an interplay of creating, performing and listening human beings. Jexper Holmen has the same experience of it, and with yet another quotation will be given the last word: "I think that around me I experience a growing urge and a will not just to write and perform music, but also to think through the contexts in which it is involved; a growing recognition that the music that can really make a difference is the music whose content can't be reduced to just a point in a score."